Chennai Super Kings (CSK) will take on Kings XI Punjab (KXIP) in the 18th match of Indian Premier League - IPL 2019 at M.A. Chidambaram Stadium, Chennai on 6 April 2019. As far as the weather is concerned, it will be a hot and sunny afternoon with a temperature below 35°C. Wind will be felt around 16 km/h with humidity around 50%. This pitch looks very dry and it might be helpful for the spinners. There is a small covering of grass but that is there to hold the wicket together. Average score batting first here is 167. The pitches used in the two matches played at the MA Chidambaram Stadium have behaved extremely differently. In the first match between CSK and RCB, spinners took 10 wickets and the quicks took 2 wickets. In the second match between CSK and RR, quicks took 11 wickets whereas the spinners took only 2 wickets. Both Kings XI Punjab and Chennai Super Kings have played 4 matches and won 3 of them are at number 3 and 4 respectively. Chennai Super Kings are coming with a loss in the last match against Mumbai Indians while Kings XI Punjab are coming with two consecutive wins. In what comes as a big blow for Chennai Super Kings, Dwayne Bravo has been ruled out for two weeks with a Grade 1 hamstring tear. Possibly Mitchell Santner will be replacing Bravo. Also, Harbhajan Singh might find a place in playing XI in place of Shradul Thakur. Kings XI Punjab might not like to make any changes to playing XI but Chris Gayle will be brought back in place of Hardus Viljoen. Chennai Super Kings (CSK) and Kings XI Punjab (KXIP) have played 19 matches in Indian Premier League (IPL). In 18 matches in IPL, Chennai Super Kings have won 10 of them and Kings XI Punjab have won the remaining 8 matches. At M.A. 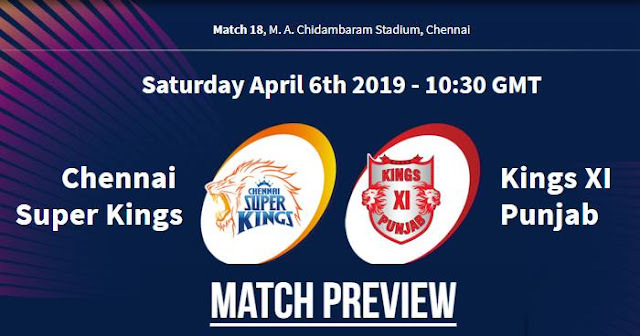 Chidambaram Stadium, Chennai; Chennai Super Kings and Kings XI Punjab have 5 matches and Chennai Super Kings have won 3 matches and Kings XI Punjab have won 2 matches. The Chennai Super Kings have a 14-1 win-loss record in the last 15 matches they’ve played at the M.A. Chidambaram Stadium. The Chennai Super Kings and Kings XI Punjab are both undefeated when they’ve batted first this season. Probable Playing XI for CSK: MS Dhoni (c & wk), Ambati Rayudu, Shane Watson, Suresh Raina, Kedar Jadhav, Ravindra Jadeja, Mitchell Santner, Deepak Chahar, Mohit Sharma, Harbhajan Singh, Imran Tahir. Probable Playing XI for KXIP: Ravichandran Ashwin (c), KL Rahul (wk), Chris Gayle, Mayank Agarwal, Sarfaraz Khan, David Miller, Mandeep Singh, Sam Curran, Murugan Ashwin, Mohammed Shami, Mujeeb ur Rahman.